Services To provide support to mental health sufferers and their families. To enable them to participate in activities they may have been otherwise excluded from. To enable people with mental illness to participate in community life. To raise awareness about mental health issues. Services Promotes positive mental health in the community. Supports those who are managing a mental health problem. Website has information on mental health issues and links to other mental health support groups. Free information talks on request.Suicide first aid training progammes available. 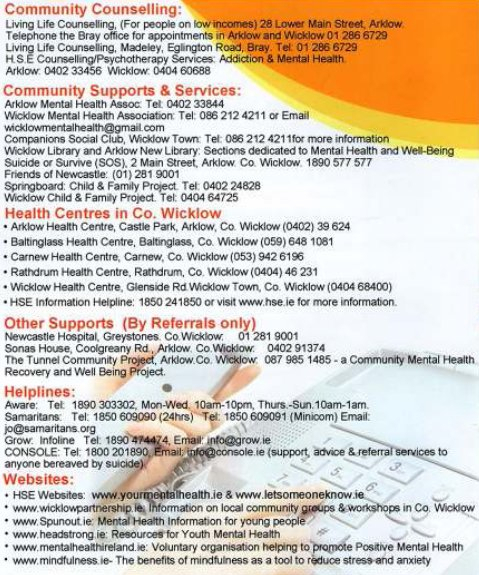 Services Wicklow Mental Health Association (WMHA) is a local voluntary organisation, which aims to promote positive mental health and to actively support persons with a mental illness, their families and carers by identifying their needs and advocating their rights.